Dubai, UAE: Breaking a Guinness World Records title, 3,196 students from GEMS Cambridge International School – Abu Dhabi, under the patronage of the Emirates Allergy and Respiratory Society of the UAE, and sponsored by Novartis, formed the ‘World’s Largest Human Image of an Organ’. 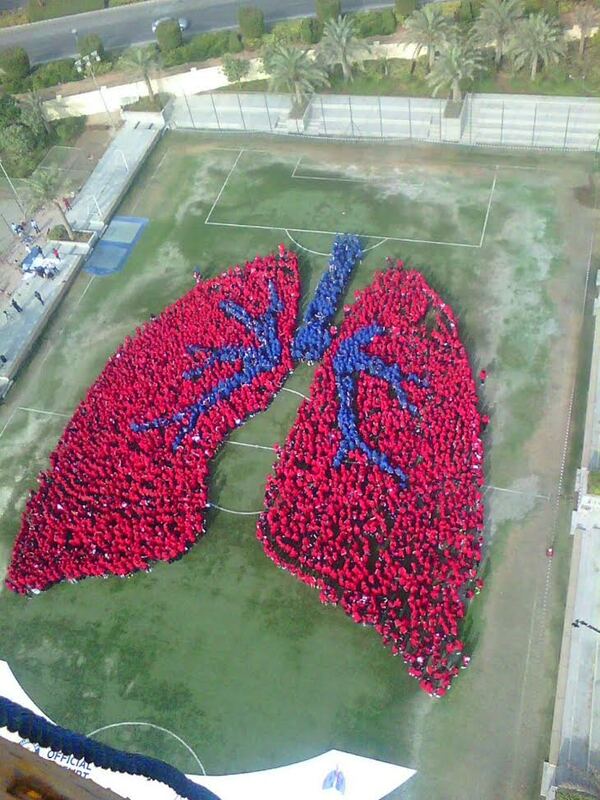 The previous world record set for a giant human lung, was created by more than 1,500 volunteers in Beijing. The purpose of the event was to create awareness about Chronic Obstructive Pulmonary Disease (COPD) – a life threatening disease associated with morbidity and mortality. The World Health Organization (WHO) estimates that 210 million people worldwide have COPD and deaths from COPD are projected to increase over the next 10 years by more than 30 per cent unless underlying risk factors are addressed. Last week, 2,223 GEMS Education students created the ‘Largest Human Transforming Image’ to pay tribute to the UAE on its 45th National Day.